"I think God must be ashamed as a creator, once he saw the preview for this movie and realized he hasn't made something this good. I suspect he's ashamed of that whole 'Jesus' thing." Up until 1999, it was the Star Trek fans who got the lion's share of attention when it came to awareness of fan culture. Trekkies (or is that Trekkers?) were spoofed on TV (Saturday Night Live, The Simpsons) and film (Galaxy Quest), and finally in their own documentary, the 1999 film Trekkies. Everything changed, however, when attention was focused on the release of Star Wars: Episode One. Soon, the Star Wars fanatics came out of the woodwork, and what had been a semi-silent fan base outside of the convention and Internet circuits gained national media attention. Most talked about was a group of fans who lined up six weeks in advance of the Episode One premier, so dedicated were they to the landmark film series. Starwoids follows the events during those six weeks, as anticipation for the film turned into something else�a cultural event, a Woodstock for the 1990s. And it all started with one boy, Daniel Alter, a 17-year-old who graduated early from high school specifically so he could claim the first spot in line at the Westwood Theater in L.A. After Daniel came many others. At the famous Mann's Chinese, the website Countingdown.com organized a group as well. At first the rivalry between the two camps was friendly, but eventually, as the Countingdown.com line grew to include extensive media coverage, charity involvement, and a web TV station that documented every occurrence, nerves frayed and tensions between and within the lines began to mount. Oddly enough, there is more drama, heart, and soul in Starwoids than in the film that inspired its creation. Daniel and his friends are positioned as the "rebels," the group of genuine fans that, really, just want to be first to see the film. From good intentions, the other group grows into an adversary, the "Evil Empire" of the piece. Director Dennis Przywara balances the two storylines well, and captures the chaos of each without taking sides. What is an already interesting piece is strengthened by sections that branch out into other areas of Star Wars fandom. There's a section on diehard toy collectors (scenes of the midnight sales of Episode One toys are spot on�I should know, I was out that night as well), a look at a fan who turned her used car into an X-Wing, interviews with minor characters from the original trilogy like Uncle Owen and a Jawa, and footage from the Star Wars Celebration that took place in early May, 1999. Oh, and then there's Star Wars: The Musical. Produced by high school students, it follows the plot of A New Hope and steals its melodies from everything from Grease to Les Miserables. You'll never look at John Travolta the same way again once you hear Go Milennium Falcon. Trekkies was a lark for Trek fans with a sense of humor, but some thought it was too eager to poke fun at its subjects. Starwoids does no such thing. It's funny, yes, and often quite so. But it celebrates the fans, and never ridicules them. If it has a flaw, it's that it doesn't offer enough fan reaction to the lackluster Episode One. But then again, why spoil an uplifting display of fan celebration with the crushing intrusion of reality? Image Transfer Review: Like most documentaries, Starwoids is made up of elements from varying sources, mostly digital video. The result is nothing impressive, but certainly serviceable. Colors look strong, as do blacks, and the image never looks overly digital or pixelated. Except for a few cases of blocky artifacting, this is about as good as I could except such material to look. Audio Transfer Review: The audio is likewise appropriate but unimpressive. Interview sound clips are well mixed with music and sound effects, and speech is always clear and understandable. Extras Review: The commentary track with director Przywara and cameraman/Star Wars collector Guy Klender (who also appears in the film) is a good listen. The two share many entertaining anecdotes about the filming process (both waited in line along with the fans for the full six weeks), and inside stories of the line experience. Przywara also talks a bit about the difficulty of editing down 80 hours of footage into an 80-minute film. There's a 10-minute interview with director Kevin Smith, who has included Star Wars references in every one of his films. It's a random inclusion (Smith had nothing to do with the making of Starwoids), but it's funny enough. The other video supplements are 7 deleted scenes. Welcome are two clips of deleted footage from the Star Wars: The Musical sequence, and are pure comedy gold. There are also deleted stories from the line, and the full music video from the Suckadelic Records sequence. Text extras include extensive biographies, a filmmaker's diary, and, oddly, Daniel's Diet, for all those curious as to how line starter Daniel lost all that weight in the year following the film. No doubt he lost most of it pining for the Star Wars of yore. 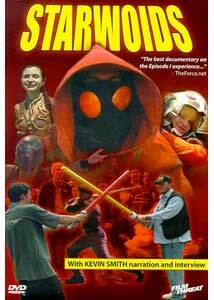 If you want an in-depth look at the fanaticism that surrounds Star Wars, look no further than Starwoids. Documentaries have attempted to probe the odd world of the sci-fi enthusiast (Trekkies), but this is the best of the bunch. IndieDVD and Film Threat have put together some nice extras, and at $19.99, the disc is a great deal.